My friend Seth Nilsson took this snapshot of legendary bass player Lars Ericsson (he is the king around here) on his porch the other night, in the light of the midnight sun that we have here now. 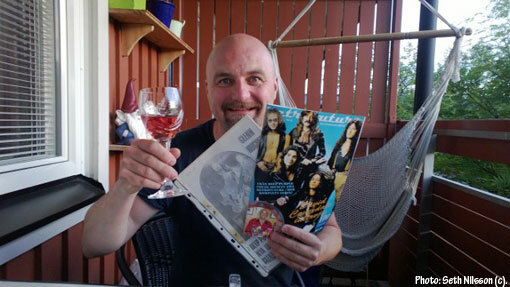 Lars is holding a copy of the very first fanzine from back in 1978 (owned by Seth) and the brand new Purple edition of RETROFUTURE 6. What a lovely surprise to get this in the mail. Thanks guys! I feel a sudden urge to listen to “Come Taste The Band” now, know what I mean? As for the Purple edition, 100 has been shipped to the States for the upcoming Tommy Bolin Fan Jam in Sioux City over there (see earlier post) and another 400 has now gone out locally with another 400 to go (still waiting for the second shipment consisting of half the print though) – although some of these will be reserved for a Deep Purple party for later in the year. Copies can be found right now at the County library in Östersund (along with a free western novel type publication – see earlier post) and at various pubs etc if you are lucky enough to spot them. Also, the record store Musik & Skit has them (I love that place, they are open Wednesdays 18.00-21.00 and sundays 12.00-16.00). Lots of positive feedback from locals now, which is very nice.